A color-enhanced ultraviolet image captured by Cassini shows Saturn's A ring. 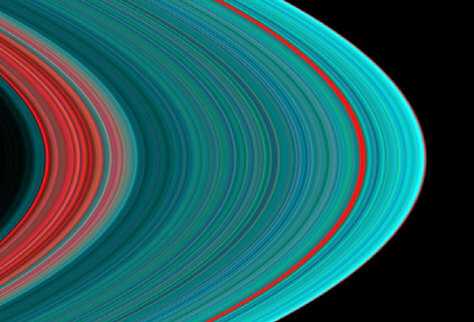 The A ring begins with a "dirty" interior of red, followed by a general pattern of more turquoise as it spreads away from the planet. The blue colors indicate denser material made up of ice. The red band three-fourths of the way outward is known as the Encke Gap.